Interested in a flying wing, but want something a little different? Now you can get one Mega Size! According to the designer (Doug Skjerseth) of the Mega Manta, "This ship was originally designed as a light lift slope combat wing". Hey Doug! This is The E Zone! That "E" stands for something... right? 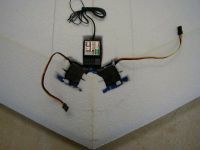 Doug finally came to his senses and decided to strap a motor and batteries on top of his wing, and the kit evolved with an electric powered thermal option. 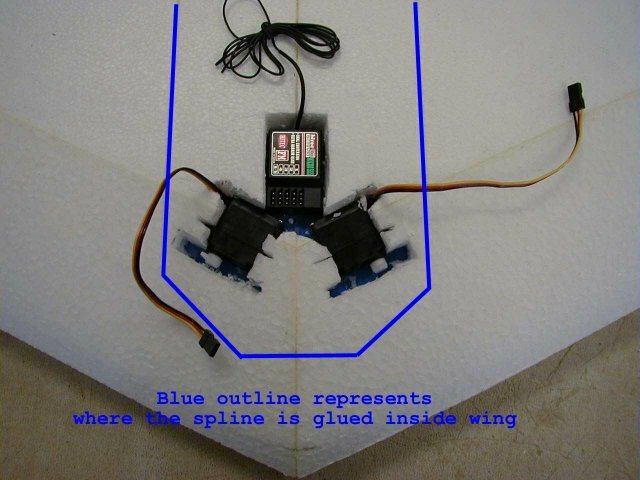 Due to the 13% thick airfoil, this kit is not designed for high-speed flying. However, no one ever really complains about having too much thrust. Interested? Please read on. 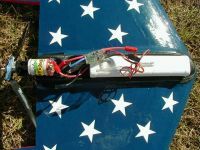 This 72-inch span electric wing is a perfect "foam frame" for some very popular low cost power systems. Additionally, the Mega Manta can be constructed for many different flying styles. What's your flying style? Do you float around low and slow? Are you interested in chasing thermals? Would you like to tear up the sky with some high thrust aerobatics? I like to do all of the above and Mega Manta can deliver this wide range of flight characteristics. With all of the recent interest in the Kyosho EndoPlasma, I thought you all would be interested to see what this ship can do with the ever-popular geared EndoPlasma sucking "go juice" from a 10-cell pack. After receiving the kit, I called the designer to get his blessing and suggestions on making a few simple modifications in the construction. 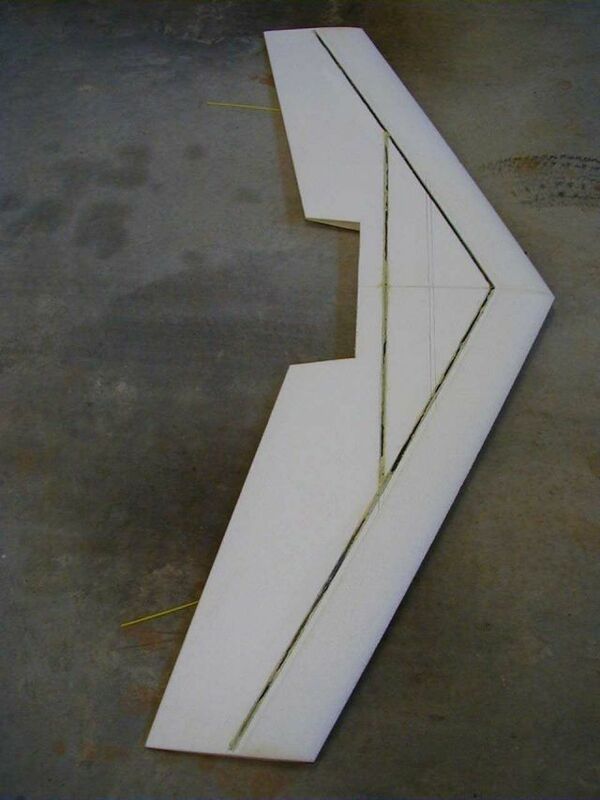 The goal was to beef up the structural integrity of the wing for a higher performance power system. With the recommended power system, no special construction materials outside what is included in the kit are necessary. While my modifications and equipment selection added 6 ounces of weight, I was not concerned since the Mega Manta has a very generous 936 sq. inches of wing area. In this review, I will highlight the basic construction and modifications used to construct the Mega Manta. The only structural modification that I made for the high power system was to substitute a carbon fiber "A" frame for the spar. As you will see, this was a very simple addition. The first few photos are taken from the designer's online instructions. I had a few problems with uploading the files on my PC during the first few steps of construction. 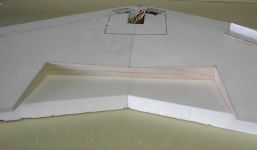 The kit comes complete with the left and right EPP and white foam wings that are packed in their own top and bottom beds. 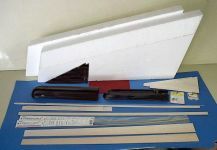 Also included is aileron stock, balsa and plastic (ABS) wing tips, some balsa stock for the trailing edge, and a vacuum-formed battery tray and canopy. Additionally, the kit provides all the hardware needed for the control surfaces. The Endo has been proven to handle higher current (40 amps) vs. the Mayhem (30 amps). Please know that neither of these motors is designed for this kind of current for extended periods at this voltage. If you throw the throttle stick wide open for the entire flight, you won't be too happy with the short life of the motor. If this is your style, I recommend using a smaller prop or a reduced pitch prop to reduce the current draw. The dual ball bearings in the EndoPlasma will last longer than the bushings in the Magnetic Mayhem. The Endo can easily be timed by loosening two screws on the back end bell. The Endo only costs a few dollars more than the Mayhem. The only downside about the EndoPlasma is that getting one has been a little challenging due to its recent "discovery" for electric flight. I completely agree with the designer's choice for the gearbox. 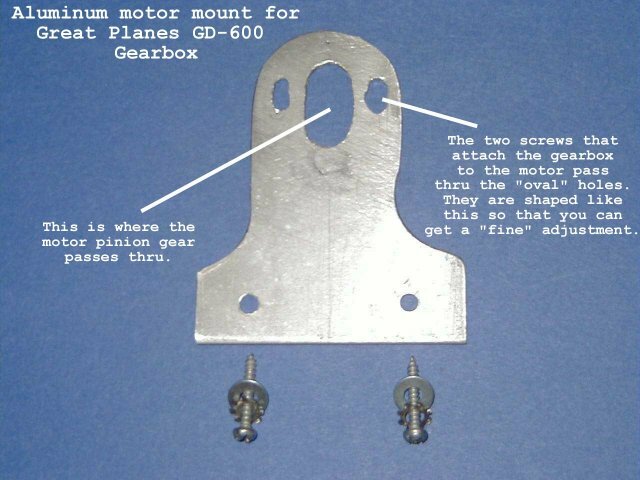 The Great Planes GD-600 gearbox is a great value and can be used with either the EndoPlasma or the Magnetic Mayhem, and has a street price around $14. What I really like about this gearbox is the design. The spur gear is not enclosed in a case; therefore, you can always see the condition of your gears without having to take apart the gearbox. Additionally, the screws that mount the gearbox to the motor pass thru an oval shaped hole; this allows you to slide the gearbox so that the spur and pinion gear mesh properly. The only downside to this gearbox is that the spur gear is plastic. Plastic gears will strip easier than metal and I can assure you that you will eventually strip this gear. Do yourself a favor and buy some extra spur gears when you buy your gearbox. The good news is that the spur gear can be easily replaced for under $3. Since I used the EndoPlasma, I did not use the stock 18-tooth pinion gear that came with the gearbox. The proper 10-tooth pinion gear is available from MEC or New Creations. The recommended prop is the Master Airscrew 12 x 8 folder. I used one of these props when I first started in electrics. While they are readily available in many hobby shops at a decent price, I prefer to use the Aeronaut 12 x 8 CAM folders, as I feel they are more efficient. A 40 Amp continuous ESC is needed when using the EndoPlasma on 10 cells. I had a New Creations M-80 sitting around waiting for a home, so this is what I originally chose to put in the Manta. If you purchase a new ESC for this setup, I would look for a "soft start / soft brake" feature, as it will be less demanding on the gears. 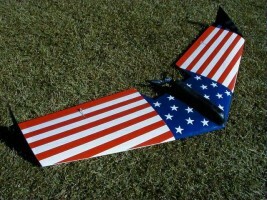 The M-80 is a nice ESC; however, the start up and brake are pretty strong for my style of sport flying. After the first few flights, I ordered a Castle Creations Griffin 55 amp ESC. This particular ESC has the "soft start / soft brake". After flying with both, I am much happier with the Griffin 55. The brake function does not kick in until three seconds after you cut the throttle. 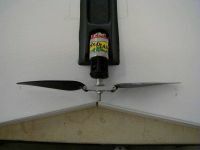 This allows the prop to "spool down" before the ESC brakes the motor. Additionally, the start up is much softer. The stock recommendation is a 7-8 cell 2400 NiCad pack or a 3000 NiMH pack. I chose to use a ten-cell 2400 NiCad and ten-cell 3000 pack, since I already use them in my other sport models. Most importantly, there is a huge difference in speed and thrust with three more cells. The instructions did not recommend what type of servo should be used. Consequently, I used the free, online Multiplex servo calculator to determine how much torque would be needed for the elevons. Based on my inputs, the calculator recommended servos that can produce 40 oz. of torque. I chose the Hitec HS-85 BB as they fit the bill for power and are lightweight. As the old saying goes, "hindsight is 20/20". 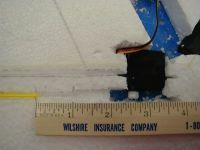 I could have used much less expensive standard size servos, as I had to add an ounce of weight to the nose for balance. I used the Hitec 555 RX as it has proven to be very reliable in my other sport models. The first step is to remove the EPP slag ("EPP strings") to create a smooth surface on the wings. The kit provides a plastic spline that is used when joining the two wing halves. I used this to separate the beds and remove the slag. 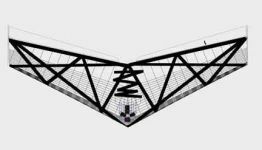 I then placed the spline on the top of the wing and traced out a top view of how the spline would be positioned inside the wing. The next step was to place the servos and receiver within the spline boarder and trace around their respective cases. To determine how deep the spline, receiver, and servos need to be placed, I had to place a servo on a block of wood and mark the side view of the wing. This is where I am not ashamed to say that you can learn from my mistake. 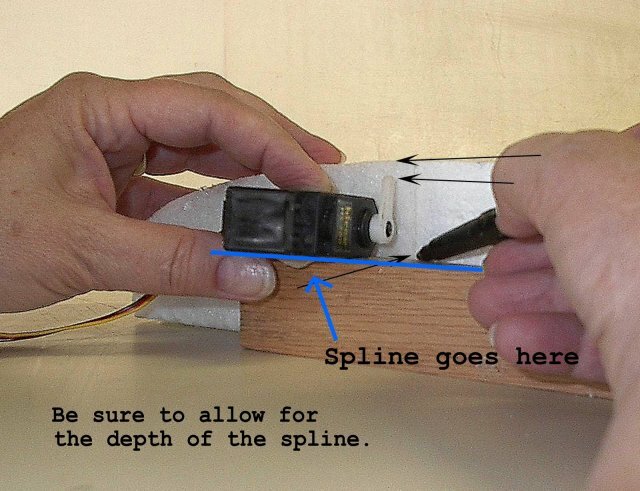 I did not take into account the thickness of the spline when marking how deep the servo needed to be. Consequently, my servo was mounted slightly higher than I anticipated. To fix this I did two things. I cut the top hole off the servo arms. Additionally, I cut out a curve piece of plastic from a plastic Coke bottle, and mounted it with packing tape before I covered the plane. 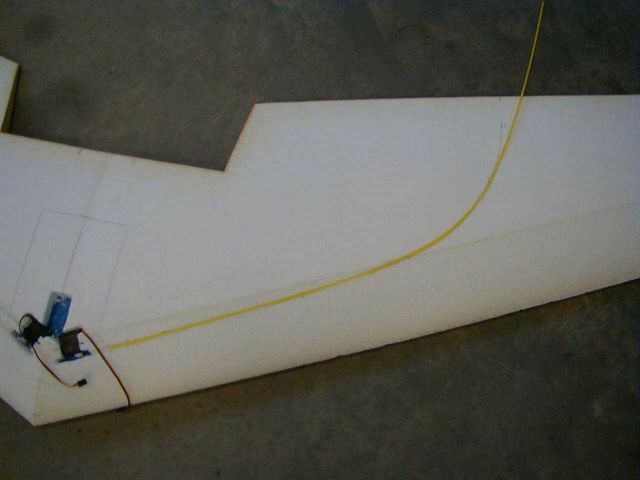 Once I had made all of the marks, I still had to cut a slot for the spline to slide inside the wing. I did this by heating a putty knife over the stove. I used a magic marker to make a reference point on the knife so that I would know how deep I needed to insert the knife. If you use this method, practice this technique on the beds before you attempt this on your wing. Here is a really important tip: Do not let the knife sit in one place too long or there will be a large gap, rather than a nice slot. I had to punch (or drill) out 1/4 inch holes in the spline. The next step was to spray the sides of the wing halves with 3M #77 spray. At the same time, I coated the spline and glued it in the wing with GE Silicone. Make sure and use GE Silicone, as many other forms of silicone will not stick to foam. Once the wing halves are glued and in place, it is time to wait 24 hours for the glue to dry. To determine the location of the back of the motor area, I had to cut out the motor/battery tray and position it on the top of the wing. This determined where the wing needed to be cut for prop clearance. The next step is to cut out the areas where the radio equipment is going to be placed. I had to make a very specific size hole to slide in the servos. The directions recommend the hot knife method. 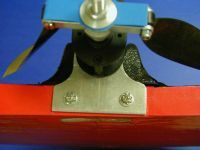 I chose to use a long bladed box cutter, as I felt that I could better control the cutter over a hot knife. You will see from my picture that the servo "slots" look a little odd. I made the mistake of putting the servos in backwards. 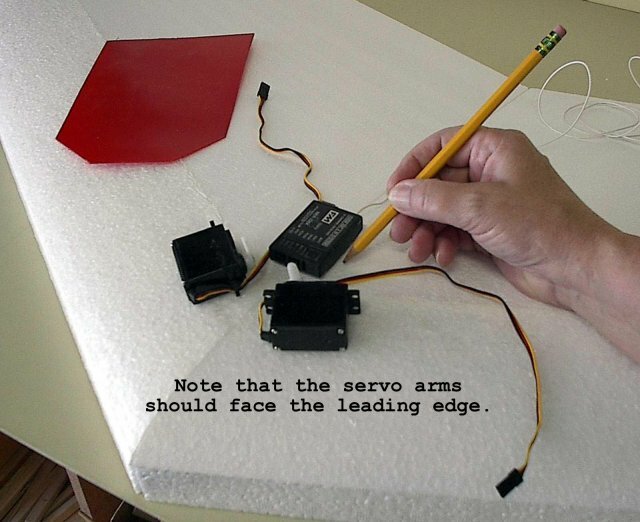 (Servo arms should face the leading edge of the wing) I followed one of the pictures in the instructions that showed the servo arms facing the trailing edge. This did not turn out to be a problem, as all I had to do was turn the servos around. The net effect is that I took out a little more foam than necessary. 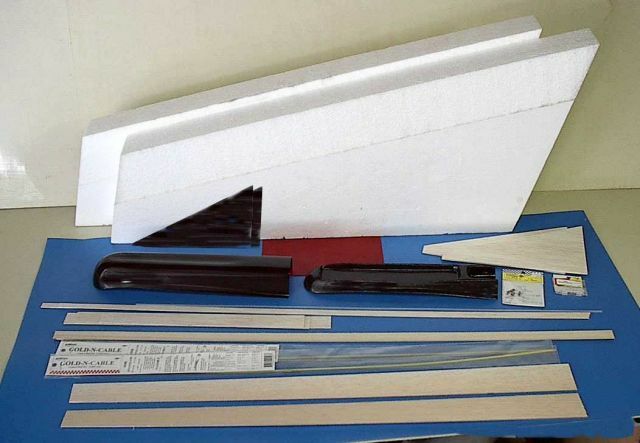 The kit provides some balsa stock to cap the trailing edge, tips, and prop area of the wing. All that needs to be done is to cut the stock to size and glue it on with the 3M #77 spray. Once the glue was dry, I sanded the balsa flush with the foam. This was the only major modification that I made from the stock setup. The recommended stock setup is a wood spar that is bowed across the wing. The designer recommended that I use some carbon fiber tubing and made an "A" frame design for increased strength. 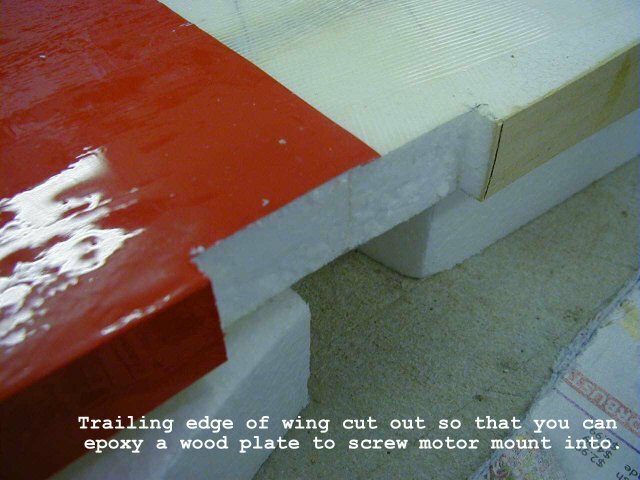 Make sure the wing is in the beds so that the wing is not warped during this step. The cross piece is located just above the recommended CG and the top tubes are just behind the EPP / white foam joint. 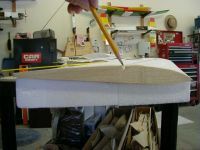 (About � inch behind the joint) All I did was lay the tubes on the bottom of the wing and trace a line of reference for cutting out a groove. The Dremel tool with a router attachment really came in handy. 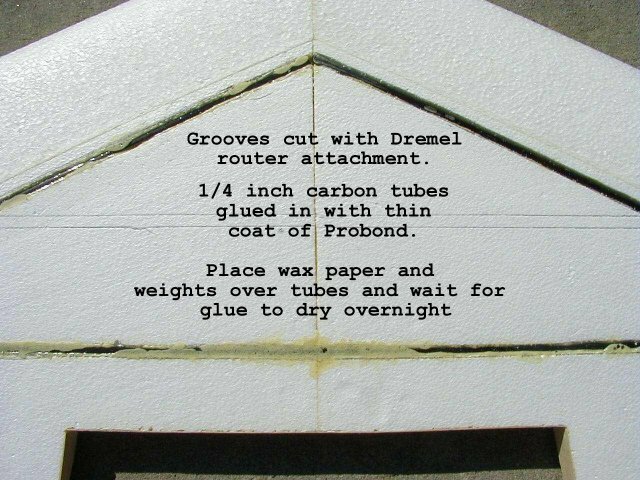 The carbon tube is glued into the groove with ProBond adhesive. The main thing to know about this product is that it expands as it dries. Therefore, you will want to place a drop of glue on something and let it cure overnight so that you will be aware of how much the product expands. It does not take much glue to do this. I squeezed some glue into an epoxy cup and brushed a thin coat to the tubes and the groove. Once I had the tubes in place, I laid some wax paper over the tubes, and placed an even distribution of weight over the wax paper. Since the final construction and a few weekends of flying, the designer has offered another option for future Mega Manta owners who plan to try "terminal high-speed dives". 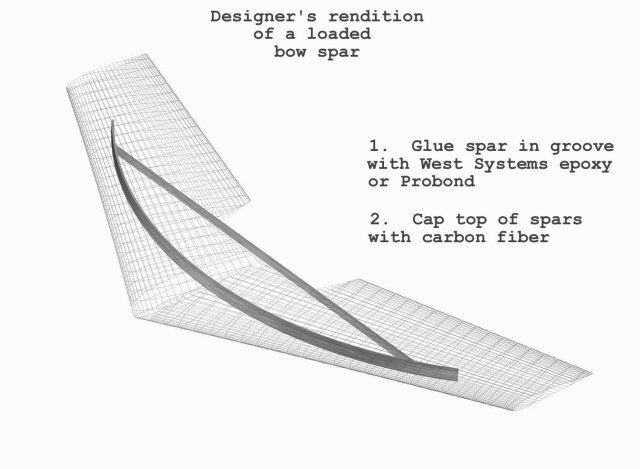 This drawing is a general concept to depict a loaded bow and cross member. 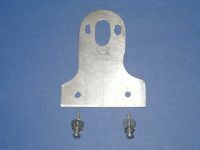 The cross member can be inserted just behind the motor mount. 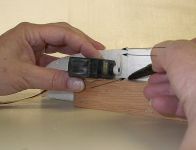 He suggests placing the cross member just behind the hand launching slot and connecting it to the bow with epoxy and fiberglass. 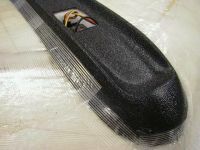 The above spar is capped with epoxy and 2-ounce carbon fiber. 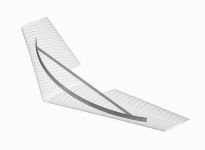 The kit provides aileron stock that needs to be cut to length and sanded. 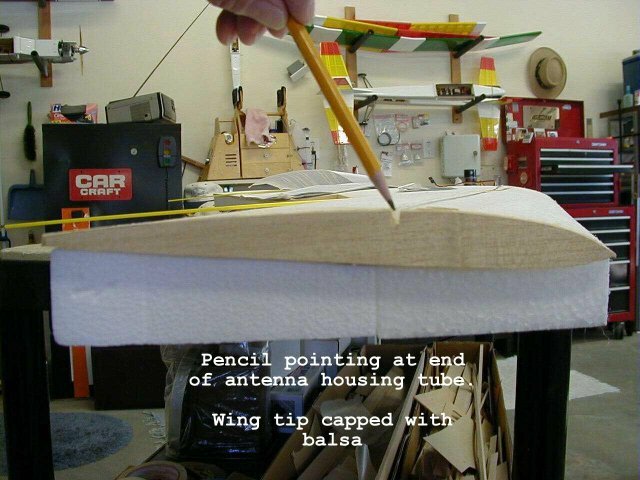 The ailerons are dry fit with tape in order to mark control horn placement and the desired endpoint for the pushrod housing. The next step was to make a groove for the pushrod and antenna housings. This was a simple as laying the housing on the wing and tracing around the housing with a pen. I used a Dremel tool fitted with a router attachment to make a nice clean groove for the pushrod cable and housing. When cutting foam with the Dremel, it is really helpful to have someone follow behind the router with a vacuum cleaner to eliminate the foam bits filling your work area. Next, I had to lay the housing on the wing and mark a starting point near the servos, and then bend in a smooth angle towards the control horns on the ailerons. I traced around the housing with a pen, and with the Dremel, I cut a groove for the housings to be counter sunk. The antenna housing was done the same way, but the groove for this tube was deeper as it intersected with the pushrod housing. I glued the housings in place with 3M #77. The pushrod cables are then cut to length, and then tinned and soldered inside the clevises. This is the point where it is time to make sure everything is working properly. Check for bindings, excessive slop etc. Fiber strapping tape is used as additional support. Once again, it is critical to place the wing on the beds so that the wing won't warp. I used a pen to mark a pattern directly on the wing (top and bottom). This told me exactly where to apply 3M #77 glue. The glue is used, as the adhesive on the tape is not enough for a good bond. The adhesive between is sprayed the lines, and then the tape is applied. I cut a square hole in my tray so that I could access the RX when needed. Once again, 3M #77 adhesive and strapping tape was used to tape the tray to the top of the wing. Since the EndoPlasma delivers considerably more power than the stock setup, I chose to make a 1/8th inch aluminum motor mount. As seen in the picture, it is ugly but very functional. 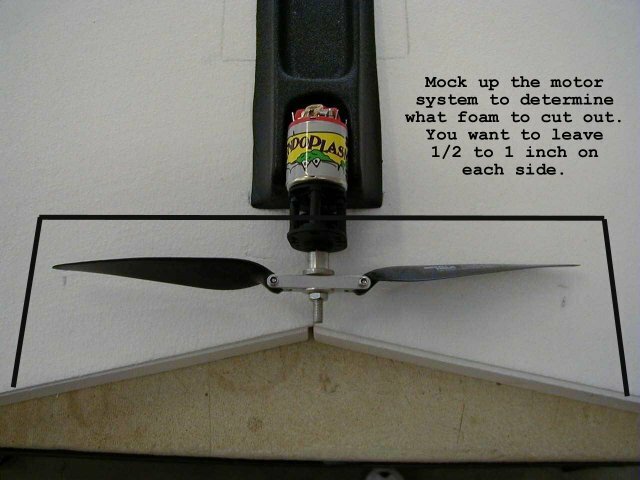 The purpose of this is to eliminate the possibility of the motor moving while in flight. Since completion of this review, the designer and I discussed this mounting method. He is going to be including a sheet of aluminum in the kits. 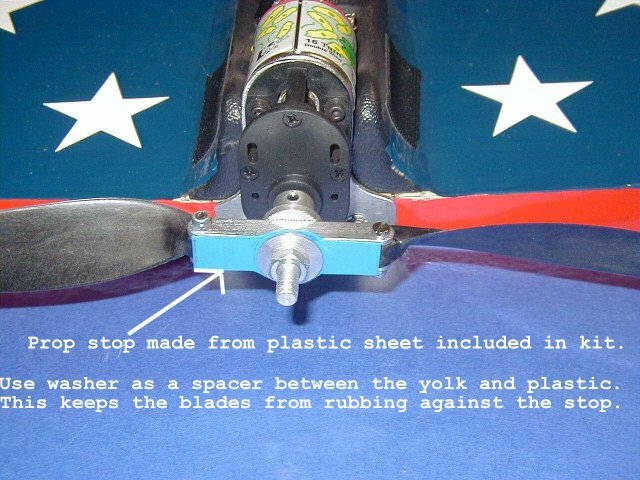 Additionally, he is going to provide a paper template designed specifically for the Great Planes gearbox. This should enable modelers to make this mount much easier. If you can't do this yourself, I'm sure a local machinist can cut it for you for a small charge. The motor mount is screwed on the back of the wing. I epoxied a piece of light ply to the foam, and the motor mount screwed onto this piece of ply. The aluminum is certainly more difficult to make, but has a real side benefit. It helps cool the motor by acting as a heat sink. Additionally, the motor is positioned with Velcro on the bottom of the can and tray. I have found tie strapping is not necessary due to the strength of the motor mount. Once again, this is another step when the wing beds may help to eliminate warps in the wings. However, it may be difficult to use the beds. In that case, care needs to be used to make sure that the wings are well supported. I think I "borrowed" somebody's layout of the "Stars and Bars". Whoever you are, credit to you. The recommended covering method is to use colored tape. I chose to cover my Mega Manta with Econocote. This is a low temperature iron on material that is suitable for covering foam. Whichever method is used, consider covering the top and bottom of the wing in contrasting colors. This will greatly improve visibility. I recommend practicing on the foam beds before covering the wing. It is also essential to ensure that the iron is hot enough to activate the adhesive, but not so hot that the foam melts. I covered the bottom of the wing is in red and the top in white. When using iron on covering, at least three 6-foot rolls of material are needed to cover the Manta. The red bars were made from basic trim sheets. 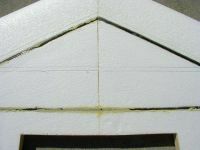 The proper way to apply this material is to spray the surface with window cleaner and coat the sticky side of the trim. This will enable the piece to float around until it is in the optimal position. I wiped up the excess liquid by using a credit card. The stars came from precut trim sheet readily available at most hobby shops. The ABS plastic canopy and battery tray are made in a vacuum mold. Figuring out where to trim the parts was not easy. There was not a real definitive line to use as a guide, so I just trimmed a little at a time. 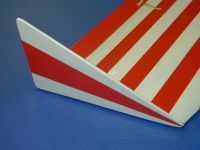 The kit includes plastic and balsa wing tips. The instructions say to tape on the tips, but I chose the Velcro mine on, and I found that this worked just fine. I first tried the plastic wing tips and experienced flutter at just above level half throttle flight. Consequently, I decided to cover the balsa tips and try them. 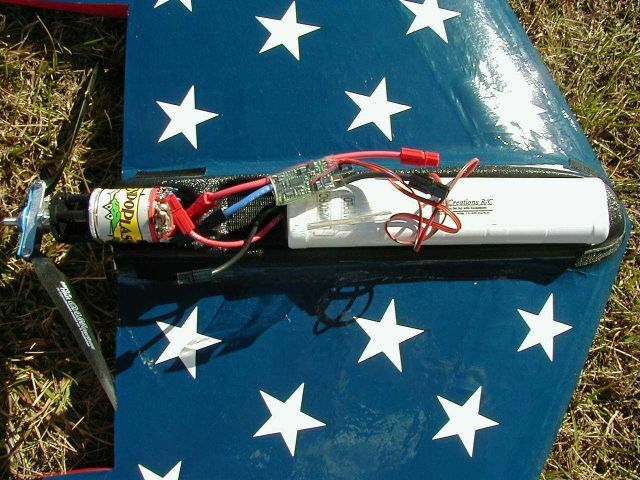 A prop stop (blue material in above picture) is used to keep the props from folding back too far, and ensure that they open properly when the motor is powered up. The included plastic material works quite well. I did have to use a washer as a spacer, since the hub on a CAM prop is different from the Master Airscrew. The Master Airscrew hub is flat and the CAM prop is round. 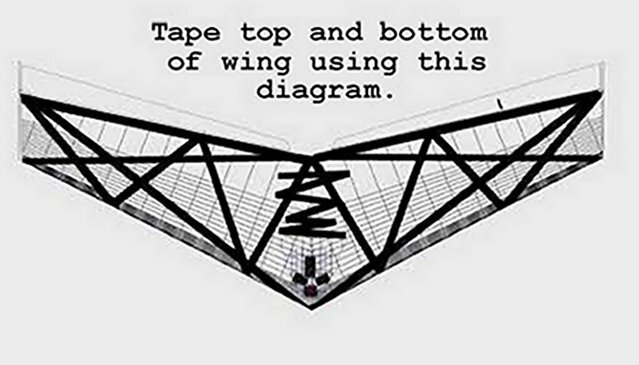 Handling this big wing for a hand launch can be made simple. I simply cut a finger slot on the bottom on the wing a few inches forward of the trailing edge. 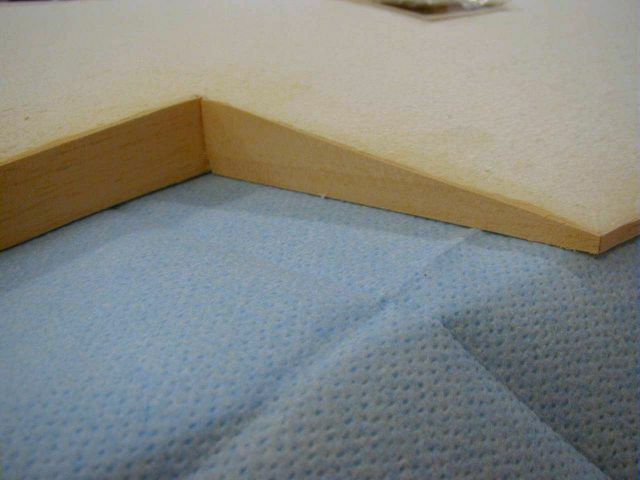 Make sure that the slot is lined with tape or light ply; otherwise, the white foam will chip out. The instructions called for the CG to be approximately 10 5/8 inches from the tip of the nose. With the power system and carbon tube spar, the 10-cell pack had to be placed at the very front of the battery tray. Additionally, a 1-ounce lead weight had to be added to the nose to get to the recommended CG. Just for reference, the front "lip" of my battery tray is located 1-1/2 inches from the tip of the nose. If you build the Manta and use the same power system, try to mount your battery tray a little further forward. This might eliminate the need for weights. In addition, as mentioned earlier, standard size servos could be used and cost much less than the Hitec HS-85 BB servos that I used. When I first got back into RC, my instructor gave me the best advice regarding electrics and I will never forget it. "Always treat an electric plane like a loaded gun". This is very true with this plane as your hands and face are very close to a 12-inch carbon blade that won't show any mercy to a carefree attitude. I was very excited to get my first flights in and was fortunate to have a nice Sunday afternoon with optimal conditions. The first toss was rather embarrassing, as I did not have enough up trim and the model "pancaked" on the ground right in front of me. Consequently, I adjusted the trim and gave it another toss. This time the Manta was gliding off nice, so I hit the throttle. It shot up at about a 45-degree angle and kept going. At this point, I knew I was in for a treat, as the EndoPlasma was putting out some serious thrust! 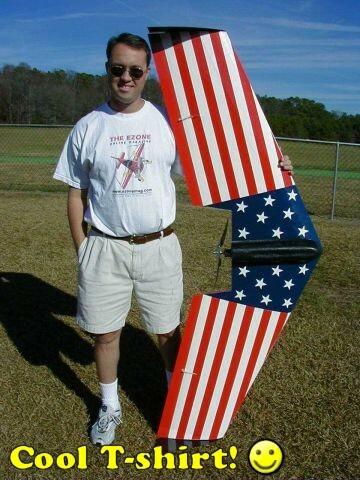 Since this was the first flying wing that I have ever had, the first flight was just for getting the feel of this type of model. I found myself increasing its airspeed then cutting power. The Mega Manta retains airspeed quite well and there is a lot of time on the sticks with the power off. This resulted in flight times ranging from 10 to 25 minutes. I tried some high-speed passes, but this plan was cut short due to the fluttering of the plastic tips. Realizing that I was going to have to pass on speed, I tested out some basic aerobatics. The EndoPlasma's thrust enables huge loops. Slow speed loops can be very tight with enough elevon throw. However, rolls were rather disappointing. My initial thought was that I did not have enough throw in the elevons. Landings are very easy, as the Manta will eventually bleed off speed and slow down to the "floater category". During another flight my first day out, I shot the Manta up high to check it out as a glider. Well...it does this too. The thermals were not too great, but it retained altitude for quite some time. After floating around a while, I decided to bring it back up a few mistakes high to see how she handled a stall. I got the airspeed too slow and realized that the elevons were not working anymore, and it commenced into a nasty spinning stall. The stall lasted long enough to get my heart pumping. Is it a design flaw? Absolutely not. The Manta just needs to have enough speed for the airfoil to be effective and for the control surfaces to work. After a few days of flying with the plastic tips, I decided to try the balsa tips hoping to improve the top end speed. The balsa tips worked much better. I can now get full throttle level flight with no problems. Rolls are much better at faster speeds. During my first day with the stiffer tips on the Manta, I pushed the speed limits by conducting a series of high-speed dives from about 400 feet. Here is where it gets interesting. I committed the ultimate "no-no" at the field. A few guys were watching the Manta in action and I yell out, "Hey guys�watch this"! I soon found that a high altitude dive at about a 45-degree angle (my best guess is around 60-70 mph) would create a violent flap of the wings resulting in the ejection of my battery pack. The first and I hope the only time I did this, my 20-ounce battery pack skipped about 275 feet down the runway. Whoops!!!! This obviously caused a serious CG problem and loss of all controls. I wish I caught it on video. Consequently, the Manta flopped to the ground. Ahhhh�.through the miracles of foam, there was no damage. After a thorough inspection, I plugged in a new pack and flew again. The Mega Manta is a big spin on a very successful and proven concept in electric flight. I liked the detailed color pictures included in the instructions. In retrospect, the construction was pretty simple. It just took some getting used to the materials used. When I think of modeling, I usually don't think of foam, strapping tape, and spray glue. If you have put together a Zagi or some other flying wing, the Mega Manta will be a breeze. For those that have not, try something new. Due to the large size, the Manta requires a decent size worktable in the construction. I used a 4 x 2.5 foot building table with no problems. While not necessary, it is very helpful to have an extra set of hands when working on this plane. My father and I worked on this project together. Some of the steps involved create those situations where it may take one person 30 minutes to complete, whereas two people only take 5 minutes. So, do you have to buy a new car to take your Manta out to field? It fits fine in my Ford Explorer. Surprisingly, I can also fit the Manta in the back of my Honda Civic. I think most cars that have a fold down back will work fine. I will soon publish some digital videos of the Mega Manta flying as soon as I can get a good cameraman. It's really hard to fly and video all by myself. Please feel free to drop me a note if you would like to share your thoughts, or if you have questions about this review.